Machined specialty washer used to correctly index flash hider, or muzzle device on threaded barrel. Made in USA!! 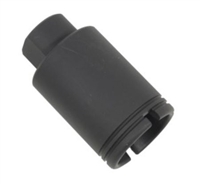 Sizing: in most cases .223/ 5.56mm muzzle device will use 1/2" washer. .308 (7.62 x 51 NATO) will use 5/8" washer. 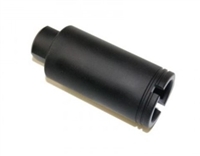 Standard A2 style flash hider. Threaded 5/8x24 with black oxide finish. Does not include crush washer. Please add crush washer if you need it. Made in the USA!! The Strike Industries King-Comp, compatible with the FF-CRD, features large dual chamber design, which was engineered to reduce felt recoil and help reduce the side concussion with the specifically angled gas ports. To top it off, the K-Comp features 4 serrated prongs provide some flash suppression. The K-Comp is a great alternative if you're looking for a cross between a compensator and a muzzle brake or effective “combo” muzzle device. Triple-port Muzzle Device and Collar Jam Nut. Designed in house to precisely compliment the platform, their Nitride Heat Treated Muzzle Brake controls muzzle impulse for ultimate accuracy and an unbelievably soft recoil. Comes complete with a Nitride Heat Treated Collar and five (5) strike prongs. Not all muzzle devices are created the same. 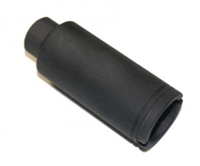 There aren't many muzzle brakes and compensators that 'understand' proper high-pressure gas dynamics. The VG6 GAMMA .300BLKOUT was designed using state of the art engineering techniques, utilizing CFD (Computational Fluid Dynamics) and CAE (Computer Aided Engineering). 100% CNC machined for optimal performance. Stainless steel construction for longevity. 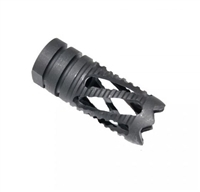 The VG6 GAMMA .300 BLKOUT is a muzzle brake and compensator hybrid. It virtually eliminates recoil and minimizes muzzle movement. The unique combination of both braking and compensating features inspire shooter confidence and allows the shooter to make very fast follow up shots. The VG6 GAMMA 556 has been tuned for versatility as well. The brake has been optimized for 10.5 to 18.5 barrel lengths, but ultra-shorty SBRs and AR-Pistols with shorter barrels and full sized 20 rifles will benefit greatly from the muzzle brake as well. Copyright © 2014 Battle Creek Armory, LLC. All Rights Reserved. Built with Volusion.